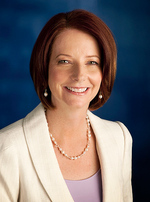 History was created for the University of Adelaide when former Law/Arts student Julia Gillard became Australia's first female Prime Minister on 24 June. The Hon. Ms Gillard is the first alumnus of the University of Adelaide to hold the country's highest office. Ms Gillard enrolled at the University of Adelaide in 1979, studying Law and Arts and taking a prominent role in student politics on campus. She was President of the Adelaide University Union in 1981-82. A fellow student unionist on campus at the time, Carol Johnson - now Professor of Politics at the University of Adelaide - remembered Ms Gillard as "immensely capable" in her student years. "I'm not at all surprised that she has risen through the ranks and become our first female Prime Minister. She is highly articulate, has an incredibly sharp intellect and can identify with ordinary Australians," Professor Johnson said. In 1983 Ms Gillard was elected National Education Vice-President of the Australian Union of Students (AUS) and moved to Melbourne, where she completed her tertiary education at the University of Melbourne. Later that year, she was elected President of the AUS. On the day the Hon. Ms Gillard became Prime Minister, she told the media that "education made me" and that "every Australian child deserves a chance at a great quality education". The University's Deputy Vice-Chancellor and Vice-President (Academic), Professor Fred McDougall, said 24 June was "an historic day for Australia and also for the University". "We extend our congratulations to Ms Gillard, who has credited her outstanding education for her career in politics," Professor McDougall said. The Hon. Christopher Pyne, Shadow Minister for Education, Apprenticeships and Training (Bachelor of Laws, 1988). "Former University of Adelaide students can be found throughout parliament and across the major political parties in Australia," Professor McDougall said. "We congratulate all Adelaide alumni - both in government and opposition - who have taken up the challenge of helping to run this country, which is one of the greatest contributions anyone can make," he said.